(Disclaimer: there is a harsh capital letter in this post… read with caution). Holy cow, when will it stop raining? So I know I’m fairly new to all these Northwest lifestyle changes, but this is just ridiculous. The weatherman (the local TV guy, not the infamous bachelorette contestant) said we are in the “rainy season.” I’m sorry, I know of only 4 seasons: Spring, Summer, Fall, and Winter. Is this “rainy season” the claimed 5th season? Like the 5th taste – umami? Can we actually even try to compare delicious umami with continual cold, sopping rain? I think not. For weeks (minus the brief relief of sun last Friday), the Oregon Coast has been cold, windy, and oh-so-rainy. This is drenching rain. The windshield wipers can’t move fast enough, rain. Umbrellas are a joke, rain. Rain, rain, bleeping rain. 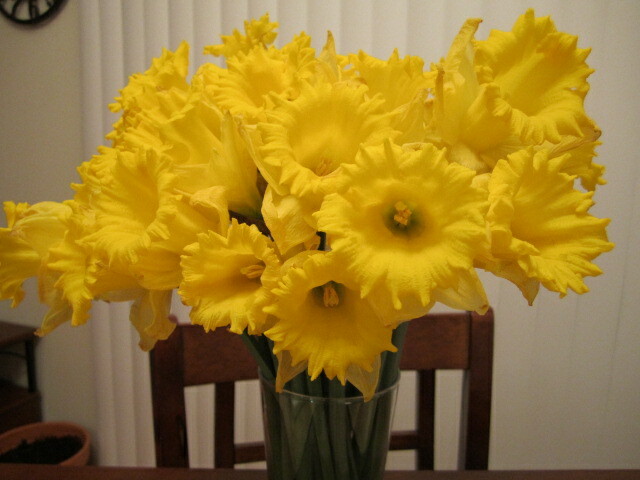 And despite all the cold wetness, it’s still the start of Spring. So along the sides of the roads, and among many gardens, bright and cheery daffodils are stubbornly sprouting and opening. They stand beautiful, strong and tall on their thin stems during giant gusts of wind and rain, sort of like giving pretty little middle fingers to the evil rain gods. If you listen close enough, you can even hear their “F-you, winter! I’m gonna grow!” protests. While I realize my tone, dripping with dreariness (pun and double entendre intended), is a downer, there are many things that I’ve realized can remedy the bad-weather-blues: sleep, eat, play Wii, cook, eat more, sleep more, run crazily around the house until an inevitable toe-stubbing, then sit by the fire. Sigh. Being that these options are about all that can be done (when it’s not exactly safe to leave the house and drive somewhere), it’s best to make the most of it. So last night, I had a friend over to make the ultimate comfort food – pasta. For Christmas, Tammy received the pasta-rolling/cutting attachments to her stand mixer, and at mid-March she had not yet ventured into the gluten-loving world of fresh pasta. Being another rainy (yet not as treacherous) night, she came over to learn the tricks. I must say, Tammy’s first time making pasta was much better than mine. She did keep all eggs on the counter, and she did not get flour all over the kitchen. She didn’t even start to sweat in the last 5 minutes of kneading, and her pasta rolled and thinned out beautifully (no stretchy holes!). We chatted and caught up on life during our little carb-filled girls night, and enjoyed a humble dinner of fresh linguini with a creamy vodka vegetable ragu (good last night, but even better today at lunch). There’s something amazing about freshly made pasta that just lightens even the heaviest sauce. 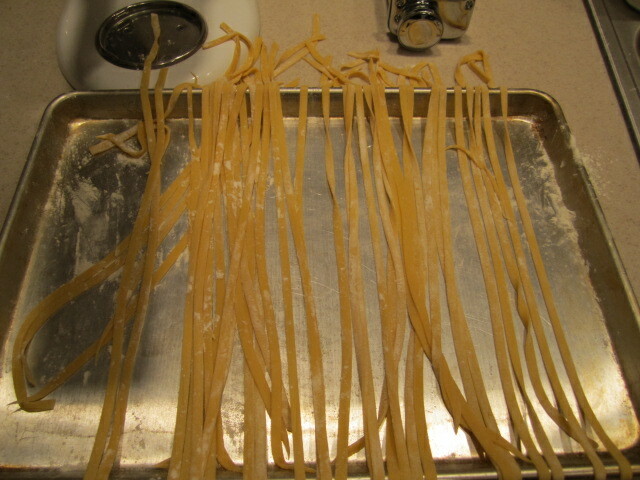 I’m a huge fresh pasta fan, and will almost always go the extra length to make my own. I also find something so organic and earthy about forming, kneading, and rolling my own pasta dough, that really does make a difference in the taste. Before I had my own pasta attachments, I would use wonton wrappers as a device to stuff ravioli filling in my mouth. 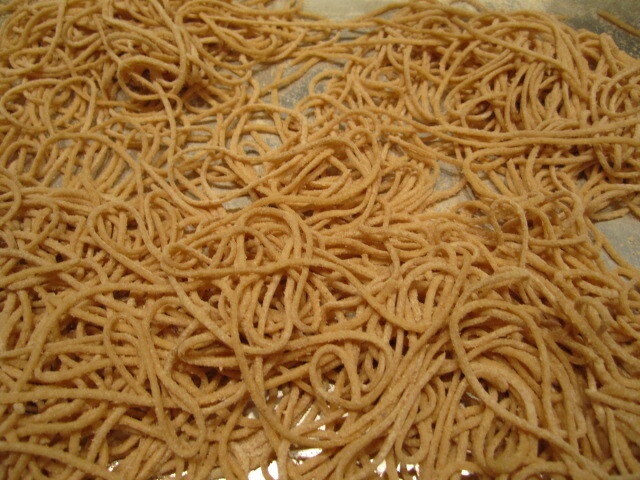 They are common, and work well (only boil for a minute or less, or saute or pan fry them in butter), and are understandably a great scaffolding step to creating and experimenting with new pasta flavors. But now that I’m making my own, I don’t plan on using those wrappers for anything other than go-to dumplings anytime soon. Enjoy the pasta recipes below, and hopefully you will find them as light, tasty, and satisfying to make as I do (and now Tammy, too!). a touch of water, if dough is feeling too dry and/or mealy when mixing. Pour out the flour on a clean, dry surface, and form into a decent well-shape (like mashed potatoes awaiting gravy). Gently pour in the egg and egg white, as well as the olive oil. With a sturdy fork, lightly start beating the egg mixture while slowly incorporating the surrounding flour. Once more and more flour is incorporated, you may need to wipe down the prongs of the fork. Mix quickly – it’s OK to get a little messy (but try to keep all ingredients in a small surface area). Once all of the loose flour is incorporated and it’s difficult to continue mixing with the fork, start kneading the dough. It will feel sticky at first, but will quickly come together and feel tacky. By the end of kneading the dough will feel springy and smooth. Knead with a purpose (pushing away with the heel of your palm, and fold back; turn and repeat), for about 10 minutes. Then cover dough with plastic wrap and let sit for about 30 minutes (the gluten have been stretched and aggravated, and need some time to relax. And if it’s your first time kneading pasta dough, you may need to, as well). Then, depending on your make of pasta rollers, set your roller to the first setting, lightly dust the dough with flour, and roll through until each time yields the same thickness (about 5-6 times). Then change the setting to the next smallest setting, and roll through (about 3-4 times). Continue until you get to desired thickness – I find with ravioli sheets, I go all the way up to the 7th or 8th setting for a thin dough, but for cutting spaghetti, I stop at 4. But it is all your preference – that’s the great thing about cutting your own pasta! Have boiling water ready (remember to heavily salt it! ), and pour in pasta. Remember, fresh pasta cooks much faster than commercially dried pasta, so don’t go call your BFF and start gossiping about last night’s Glee. Cook until Al Dente (slightly toothsome – no one likes mushy pasta) and serve with sauce, or just barely undercook it and throw into your favorite sauce warming on the stove (the pasta will finish cooking in sauce pan). It’s more than worth the time to make. Please ENJOY! When I was growing up, my mom had some pretty fantastic go-to meals. Her pan-fried chicken breasts were awesome, the chicken “drumsticks” with green beans was a classic, and her tuna noodle casserole – out of this world. But one of my favorites (and one she still makes for me whenever I visit) are English Muffin Pizzas. I’m not sure how or when this meal was created (I think by my Nana), but she often made it during a weeknight when Jenn needed to be picked up from soccer practice, and my basketball practice ran late, and there was still homework threatening late-night hours if it wasn’t quickly attended to. I can only imagine what it feels like as a parent to have a nutritious dinner on the table on nights like that. I remember jumping into the hot shower after practice dreading the pre-calculus problems that should have been done way prior to it being dark outside, all the while feeling exhausted from the many “suicide” runs Coach made us do for “conditioning.” I would take my time – too much time – showering and step out to be greeted by one of the best food smells: toasted Thomas’ English Muffins with marinara sauce and melted American cheese – the Kraft kind. Mom served it with an Italian salad, but I always ate the salad last as to not miss out on the straight-from-the-oven goodness. The English Muffin would crunch, the cheese would stick to the roof of my mouth, and the taste was so familiar, so comforting, that it gave me the warmth and energy to attack those pre-calculus problems before bed. Well, last night was one of those nights where I jumped into the shower after a decent pilates/yoga class (where I found I really need to work on my balance – I looked like a drunk penguin trying to balance on one foot) wishing I had that English Muffin Pizza waiting for me afterwards. Alas, I realized I had no English Muffins (and only the Thomas’ kind would work), no marinara, and I think our Kraft singles might have seen their last days a few months ago. My best ideas come to me while I’m in the shower, and I think most people would say the same thing (though they may not outwardly admit it). It’s a good thinking spot – relaxing and warm, just comfortable. Craving the English Muffin Pizza and not able to have it, I pondered the never ending question – what to make for dinner? I had my leftover soup for lunch, and didn’t want to double dose in the potato starches, and being that The Bachelor was going to start in an hour (much more fun than math homework), something quick, easy, and healthy were necessary. Remembering the Italian Flatbread dough I had pre-made and saved for times just like this, I toweled off, made a flurry of a mice en place, and whipped up a Raw Italian Pizza. 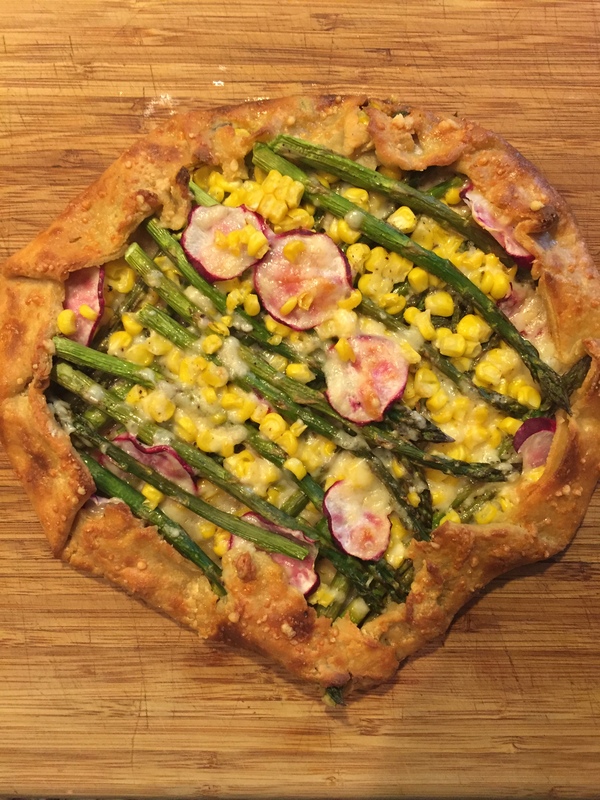 Now, this “raw” pizza is not the never-to-exceed 118 degrees Raw. I call it raw because of the length of time it takes to cook the sauce: 15 minutes. Don’t get me wrong, this is no 4 hour bolognese and will not have the same depth and sweetness that tomatoes take on after being exposed to heat for an extended period of time. But being a tomato lover, especially now when they are nowhere near seasonal peak goodness, the canned stuff is the best bet. Good plum tomatoes are canned at their peak, retaining that juicy, tangy, acidity that raw tomatoes are known for. So, a quick hot bath with some excellent Chianti did the trick for a tangy 15-minute sauce. Now the toppings – something simple, elegant, and loaded with flavor: pesto. But this isn’t your usual pesto. Using blanched broccoli as the base, this pesto combines healthiness with a flavor so intense you’ll never go back to simply basil pesto. Layered with baby spinach leaves and shaved parm, this rustic looking flavor bomb left Rob and me chewing and speechless at the dinner table. 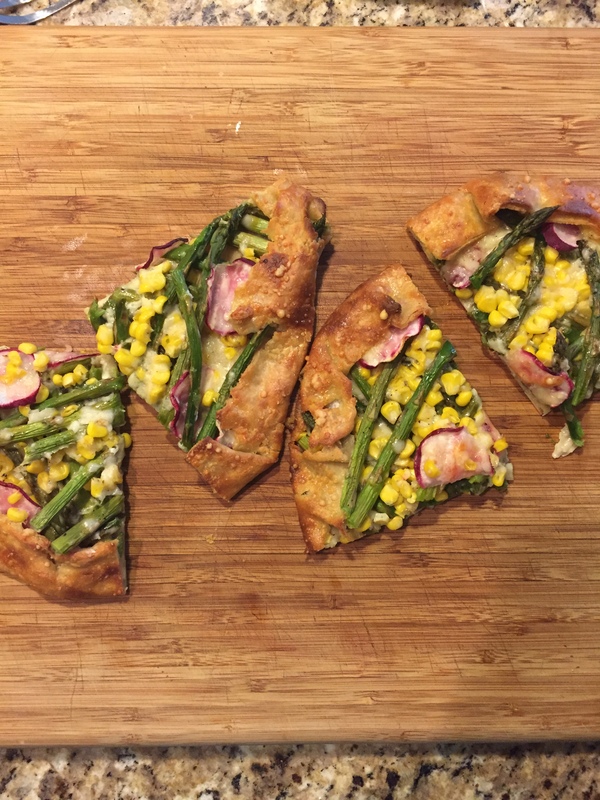 Granted, it did not take place of Mom’s English Muffin Pizza, but it was definitely worth the try! 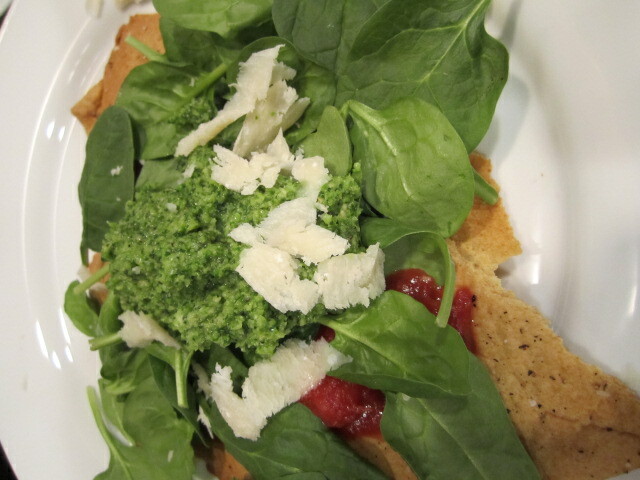 -With the below ingredients, you will also need baby spinach leaves (or another green of your choice), and shaved Parmesan Regiano cheese. Mix all ingredients in a stand mixer with the dough hook attachment, until mixture forms a ball. 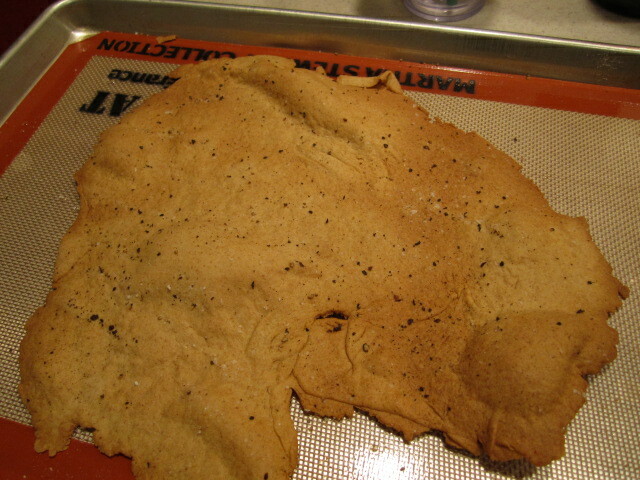 Turn out onto floured surface, and knead for about 7-8 minutes. Slice into 3-4 pieces, and make them into disks. Wrap with plastic wrap and set aside to rest for about 30 minutes (after rested, dough can be put in freezer to use at a later date). On a floured surface, use a rolling pin to roll out dough into a rustic shape (I just let the dough do it’s thing – you’ll break apart the flatbread, like a lavash, later), until very thin, about 1/8 of an inch. Sprinkle with a bit of s&p. Bake for about 10 minutes, until browned and crispy. Dough will start to bubble in parts, but that is ok. 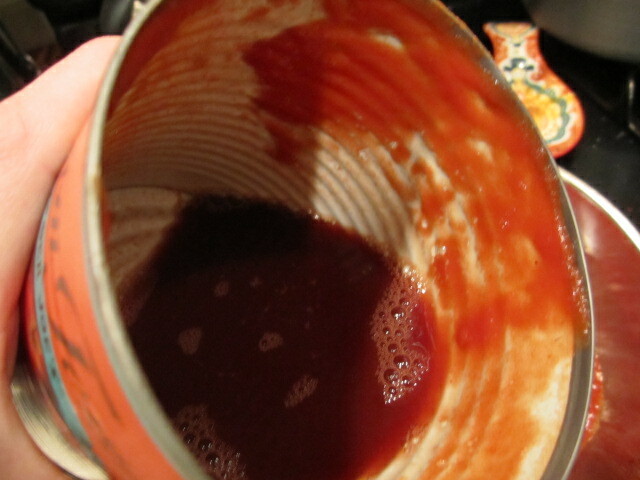 NOTE: When you want to get all of the juice from the can of tomatoes, pour in the wine to “wash” the sides of the can (above picture). That way you make the most out of all of your ingredients. Heat all ingredients in a large saucepan on high heat, for about 15 minutes, occasionally stirring and breaking apart whole tomatoes with wooden spoon. Sauce will reduce and thicken, become sweet, tangy, and remain very tomato-y. Combine all ingredients except the olive oil in a food processor. Add a bit of oil to get the blade moving, and once ingredients are pulsed, pour the rest of the olive oil in a thin stream into the feed tube while processor is running. Taste for seasoning. The final texture should be like a paste. 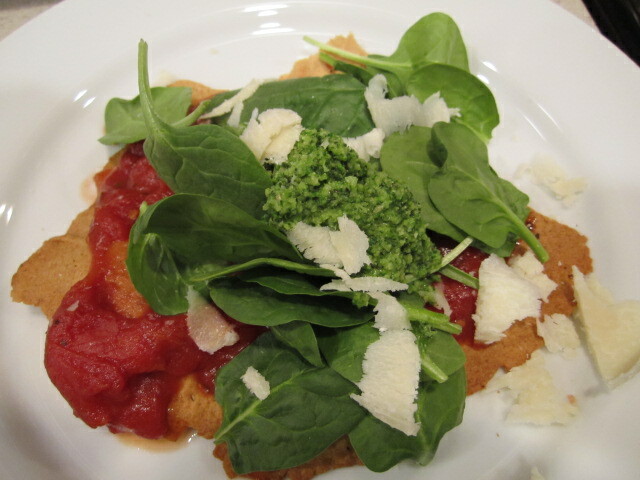 *** Assemble the ingredients: flatbread on the bottom, top with tomato sauce, baby spinach leaves (or other green of your choice), a dollop of pesto, and shaved parm reg.